Broadlands services was marked as a service station by Ordnance Survey until 2013. It only offered food and fuel. Little Chef signs on the building. 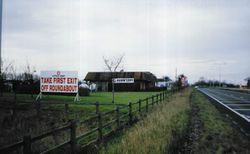 The service station was built by Kelly's Kitchen in partnership with Petrofina, shortly after the Blofield Bypass opened. It was first planned in 1986 but opened in around 1989 as 'Postwick services'. Like all their projects it had a large building, with an overhanging roof and a tall chimney. Shortly after it opened, Kelly's Kitchen were purchased by Trusthouse Forte who re-branded the restaurant as Little ChefHistory. The restaurant continued to trade until February 2012, when a wave of closures saw it boarded up. It was later purchased by McDonald's and given a significant refurbishment. The forecourt became Fina, then Gulf in 1998, after that Total, and then in 2012 changed to Shell.